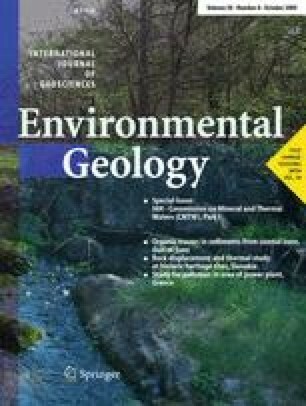 This study was undertaken to determine whether recent anthropogenic changes in the Nile basin have affected the modern rate of sediment accumulation in the Nile delta. Excess 210Pb, 137Cs, and 239,240Pu were used to develop a sediment chronology for a core from central Manzala lagoon, the delta sector which has had the highest average rate of sediment accumulation during the Holocene (to about 0.7 cm year–1). Excess 210Pb was detected in the top 32 cm of the core, yielding an accumulation rate of 1.2 cm year–1, higher than the mean rate for the Holocene. A high 137Cs/239,240Pu ratio requires a reactor source (possibly Chernobyl) for these nuclides. Low concentrations of excess 210Pb and weapons-fallout nuclides precluded recognition of changes in sediment accumulation rate in Manzala lagoon during this century and may limit the use of tracer radionuclides for modern sediment chronology in the Nile delta.